Want to trick or treat but without the travel? Trunk or treat is the perfect solution for churches, schools and neighborhoods that want to celebrate Halloween while being safety-conscious. Start decorating your car with these creative themes and tips that will satisfy any little ghost or ghoul. Pumpkin Patch - This is a quick and easy way to decorate. Incorporate real and cutout pumpkins of varying sizes and use hay bales to display your jack-o-lanterns. Invite passers-by to play a game of bag toss for candy and prizes. Haunted Tunnel - Create a haunted tunnel using large tarps and boxes. Connect the boxes with the tarps and decorate the inside with friendly (or not so friendly) spirits with neon spray paint and cutouts. Candy and small prizes are a great reward for getting through the tunnel. Graveyard - Purchase funny or unusual gravesite markers from your local Halloween or craft store or create your own using Styrofoam, construction paper and markers. Let visitors wander through the graveyard and pay respects to the long departed. Incorporate dry ice to raise the creepiness factor. Spider Web - Get tangled up in the fun with this trunk or treat idea! Purchase packs of spider webs and string them across the back of your car. Mix it up with neon or glow-in-the-dark webs that come alive when the lights go down. Ask visitors to guess how many spiders are in the web for the chance to win a prize. Candy: Pass on the candy and go for spider rings! Monster Mash - Everyone knows monsters love to party so turn up the Halloween-themed music and let the dancing begin. Decorate your car with balloons, streamers and monster cutouts. Use car speakers or bring a portable one and invite people to participate in a Halloween dance contest. Black and Orange Party - Celebrate the colors of the season with a black and orange theme. This is a quick and economical idea that looks fantastic. Place black and orange streamers, balloons and confetti in and around your car. Make cutouts of bats, witches and brooms using the theme colors to go all out! Mad Doctor Lab - Invite little scientists to your lab for a creepy night of trunk or treating. Set up a table to display the Mad Doctor’s experiments gone wrong. Kids will love getting their hands dirty as they feel the brains (spaghetti) and eyeballs (hard boiled eggs) of past patients. Pirate Fun - Ahoy, matey! Transform your trunk into a high-flying pirate ship using sheets for sails and ropes for ladders! Put a treasure chest in the center of the “ship” and let kids have a go at finding buried goodies. Keep a stash of pirate hats, swords and other accessories for selfies. Scary Skeletons - This classic trunk or treat theme will tickle everyone’s funny bone. Don your trunk with skeletons of every shape and size and let them “hang” out. Black and white balloons and strategically placed flashlights really bring this theme together. Witches Kitchen - Those crazy witches are at it again! Set up a culinary masterpiece with several large pots and pans filled with bats, bones, shoes and other mystery ingredients. Top with dry ice to create a bubbly meal no one wants for dinner. Have a large paddle ready so everyone can take a turn stirring up trouble. Mummy Mischief - Have a ball getting tangled up in the toilet paper and let your inner mummy come through. Set the stage with unrolled toilet paper and coffin cutouts. Let little treaters get wrapped up in the fun and pose for a quick picture only a “mummy” could love. Black Cat Crossing - Is it good luck or bad luck when a black cat crosses your path? There’s only one way to find out. Using chalk, draw a maze around your trunk or treat area. Challenge the little ones to get to the finish without running into a feline. Bonus idea: Work with the Humane Society to host a feline adoption event. Graveyard Ball - Everyone is invited to the creepiest get together of the year! Embellish ball gowns, prom dresses or suits found in vintage or second-hand stores and dress to be the host and hostess with the mostest. Play some mood music and have trays of candy and juice ready to pass around to the honored guests. Broomsticks - Take a ride on one of the most popular modes of Halloween transportation. Gather brooms from your closet (and your neighbors and friends) and use them to decorate your trunk and hold on for an adventure. Host “broom” races and let kids run across the finish line (broom in hand) for prizes. Dracula - He loves the dark, bats and sleeping in a coffin! Make Dracula feel at home in your trunk with low lighting, dramatic music and red holiday lights. Don’t forget your cape and candelabra! Frankenstein - It’s alive, it’s alive — and it is the perfect theme for trunk or treat. Go green for Halloween with Dr. Frankenstein’s monster. Use a cutout of this mythical character or get creative and create a life-sized likeness by gluing multicolored plastic cups to poster board. Dress in a lab coat to complete the look. It’s the Great Pumpkin, Charlie Brown - Everyone loves a classic! Celebrate with Peanuts character cutouts and go bobbing for apples while you wait for The Great Pumpkin to arrive! Harry Potter - Ghost and goblin season is the perfect time to dig out your wands and invisibility cloak and bring the gang together with Harry, Hermione and He Who Must Not Be Named. Put a large hat on a stool and let kids take turns finding out which “house” they belong to or string up dollhouse-sized tables, chairs, plates and glasses to recreate the Hogwarts dining hall. Ghostbusters - Dress the gang as the ghost-fighting foursome and prepare to take on the Stay Puft Marshmallow man. Use your trunk as a “Hall of Fame” displaying all the ghost and spirits the Ghostbusters have put to rest. Don’t forget the Proton Pack. The Legend of Sleepy Hollow - Bring this tale to life with a spooky forest, Ichabod Crane and a headless horseman. Decorate with dry ice, gravestones and pumpkin “heads” scattered about. Don’t forget the mood music with galloping horse hoofs. Clue - It’s a classic whodunit just in time for Halloween. Enlist the help of friends and family to dress up and play the parts of Mr. Green, Mrs. Peacock and Professor Plum to welcome trunk or treaters. Turn the back of your car into a library with stacks of books and ask guests who they think done it. Candy Land - This is a simple trunk or treat idea with huge appeal. Create board game squares with colored construction paper and line the path with large candy cutouts like lollipops, peppermint sticks and gumdrops. Bring a spinner and let kids work their way through the board to earn treats. Monsters Inc. - Recreate the workplace of expert “scarers” Mike and Sully by decorating your trunk with doors. Purchase small party bags of varying sizes and colors and draw doorknobs and hinges to create the perfect look. String the bags together along the outside of your car to set the scene. Wizard of Oz - Bring Dorothy, the Scarecrow, Tin Man and Cowardly Lion to a Halloween party where everyone’s invited. Use gold paper and lots of glitter to form a yellow brick road leading right to the candy. Turn the back of your car into the Emerald City with green fabric and more glitter. Star Wars - Bust out the lightsabers and call in the Wookiees, it’s time to trunk or treat Star Wars style. Find a celestial or space-patterned tablecloth for the background and hang planets and galaxies from the roof. May the Force be with you! Lego Movie - Everything is awesome when you trunk or treat with Legos. Build your favorite characters out of cardboard boxes, markers and colorful paint. This is also a great way to display your Lego collection. For extra “wow,” assemble a Lego Halloween set and put it on display. Mickey Mouse - M-I-C-K-E-Y-M-O-U-S-E is as classic as Halloween. Sport your Mickey Mouse ears and Goofy hats and recreate Cinderella’s castle using party-themed tablecloths. Take your visitors on a trip to Disney World in the Halloween glow. Cat in the Hat - That mischievous cat would not want to miss Halloween! Honor the iconic feline with his signature hat and don’t forget Thing 1, Thing 2 and the wise fish. Add to the whimsy by displaying Dr. Seuss quotes throughout your trunk and fill in any gaps with tons of color. Genius Tip: Try these 30 Seussisms to inspire you. Superheroes - Dressing like your favorite superhero or villain is what the October 31 holiday is all about. Channel your alter ego, don a cape and release your superpowers to make the night spooktacular. Use cardboard cutouts to create a skyline perfect for crime fighting and print colorful posters with comic strip words like “POW” and “SMACK” to inspire super fun! Fairies - Venture toward the playful side of Halloween with enchanted woods and beautiful fairies. Glitter, wings, flutes and music can make your trunk sparkle and stand out from the crowd. Decorate with white holiday lights and bed sheets to create a magical world you might not want to leave. Cookie Monster - Let the big blue furry monster hang out and offer the kiddos cookies of every shape and size. Find a piece of blue fabric to drape across the back of your car and put Cookie Monster’s “face” on using construction paper cutouts. Christmas Celebration - Who says you can’t celebrate Christmas at Halloween? Not us. Break out the holiday decorations early and string the car with lights and ornaments. A visit from Santa really makes it special! Birthday Fun - Blow out the candles and make a wish, this trunk or treat celebrates everyone’s birthday! Decorate with “Happy Birthday” signs, streamers and balloons. Give visitors a party hat and balloon just for their special day. Whether kids are turning one or 101 they will enjoy this birthday celebration just for them. Under the Sea - Take little ghosts and goblins on an under the sea adventure. Enlist the help of stuffed animals to create an underwater dreamland with fish, seals, whales and sharks. Let your creatures swim free in the ocean made of green and blue balloons. Throw Back Halloween - Pick a favorite decade! Recreate a soda shop of the 1950s, give peace a chance in the 1960s, hit the disco in the 1970s or bring back the neon and legwarmers of the 1980s! Whatever theme you choose, go all out with TV titles, movies and music of the era. Halloween Luau - Why wait for summer or a tropical island vacation to have a luau? Don the hula skirts and coconuts, hang some festive decorations, blow up the palm tree and turn the tiki bar into a candy bar. Make it a party with a hula hoop contest! Pyramid of Treats - Transform your trunk into candy store galore by displaying sweet treats as far as the eye can see. Use boxes of varying heights and sizes, cover them up with festive tablecloths and put individually wrapped candies in clear jars. We guarantee it will be a hit! Gone to the Circus - Entertain the crowd with a circus theme. Use hula hoops to create “stages” with clowns, face painting, world’s strongest person and a lion tamer. Make a tightrope and include a mini-trampoline for kids to perform a few acts of their own. Zoo Safari - This is an easy theme to pull together using items from around your house. Scatter branches and leaves from your yard to create the safari plain, then round up the stuffed animals or use cardboard cutouts to make your car come alive with creatures. Keep the animals from escaping with a baby gate across the back. Gone Camping - Spend a chilly autumn evening warming up by the campfire. Set up tents and sleeping bags around a cellophane-created “fire” for a night under the stars. Gather everyone around for a song or two and don’t forget the marshmallows. Location, Location, Location - The first thing you need is a place to host the event. If you are a church, school or another organization with a parking lot, this is the easy part. If you need a location, check with parks, athletic clubs, community centers or other places with space to accommodate the event. The venue might require a permit so start your search for the perfect place early. Recruit Volunteers - A trunk or treat event is only as successful as the people who sign up to help. 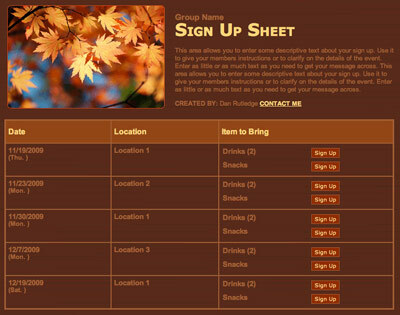 Use SignUpGenius to recruit people for set up and break down tasks and get everyone excited about the event. Set the Date - Decide on a trunk or treat date and try to avoid Halloween as some families enjoy trick-or-treating in their neighborhood. Also, review school and community calendars to be sure you aren’t conflicting with any major events. Registration - Ask participants who plan on attending to register for the event. It is important to know how many trunk or treaters are coming to ensure you have enough space and candy. Keep It Moving - Determine how to manage the trunk or treater flow. You can give tickets to each family to “spend” at each candy stop or provide a card that trunk or treater hosts can stamp. 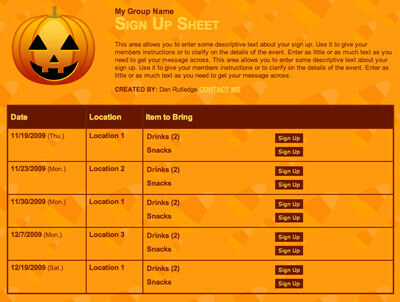 Plan Activities - Give kids and their parents something to do in between trunk or treat stops. Simple carnival-style games like ring toss or “fishing” games are popular, or if your budget allows, hire a juggler, caricaturist, balloon artist or magician. Genius Tip: Start with these 30 Halloween games and activities. Feeding Frenzy - Depending on the time of day, schedule food trucks or ask a few volunteers to cook up hot dogs, hamburgers and a veggie option. Prizes - Everyone likes to be rewarded for their efforts. Create several prize categories for trunk or treat participants and stir up some inspiration. Give awards for the most creative decorations, spookiest trunk, best game, favorite candy, etc. Have prizes ready and announce the winners before everyone goes home. You can enlist the help of special judges or ask participants to vote. Promote, Promote, Promote - Be sure everyone who needs to know about your event does. This is also a way to let new families know about your organization! Spread the word on social media, organization newsletters and fliers. Get Ready for Next Year - Take tons of pictures to use for next year’s promotion. If you enjoyed the venue, book it as soon as you can for the following year. 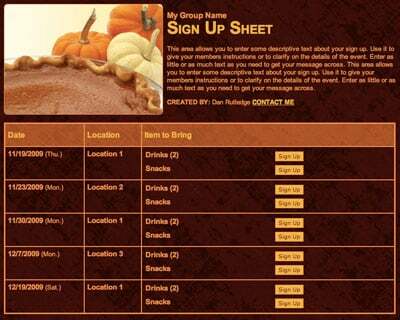 Coordinate a neighborhood Halloween party with an online sign up!